The current events comedy king is back! Five-time Emmy Award-winning comedian, writer, talk-show host and actor, Dennis Miller is back! Catch him up close and personal when he performs near you soon! Miller will be going it alone with his unique observations on sport, politics and everything in between! Nothing is off-limits to Miller, who cut his teeth on the scene with Saturday Night Live, using pop culture references and his trademark idiosyncratic style of talking. Today he is one of the leading comics on the US circuit, with appearances on TV, radio and film, with a huge focus on current events. Formerly an outspoken critic of the Republican party, the once-liberal Miller is now a staunch neoconservative. Like many of his peers, David Miller rose to fame on that infamous springboard for stand-up success - Saturday Night Live - when he joined the television show as their Weekend Update reporter, his deadpan satire-based humor a perfect fit for the show's audience. During the early 90s, he decided to go it alone and starred in his own TV show quite ingeniously called... The Dennis Miller Show. Sarcasm aside, the show was sadly canceled after just seven months however it did pave the way for the Emmy Award-winning Dennis Miller Live which enjoyed a more successful stint than its predecessor, running for almost a decade on HBO. Sound good to you? 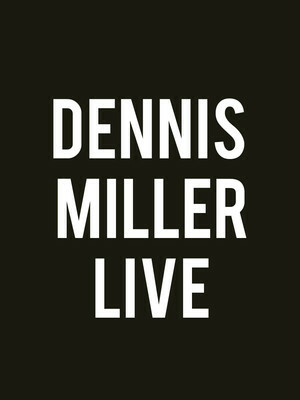 Share this page on social media and let your friends know about Dennis Miller at Paramount Theatre. Please note: The term Paramount Theatre and/or Dennis Miller as well as all associated graphics, logos, and/or other trademarks, tradenames or copyrights are the property of the Paramount Theatre and/or Dennis Miller and are used herein for factual descriptive purposes only. We are in no way associated with or authorized by the Paramount Theatre and/or Dennis Miller and neither that entity nor any of its affiliates have licensed or endorsed us to sell tickets, goods and or services in conjunction with their events.